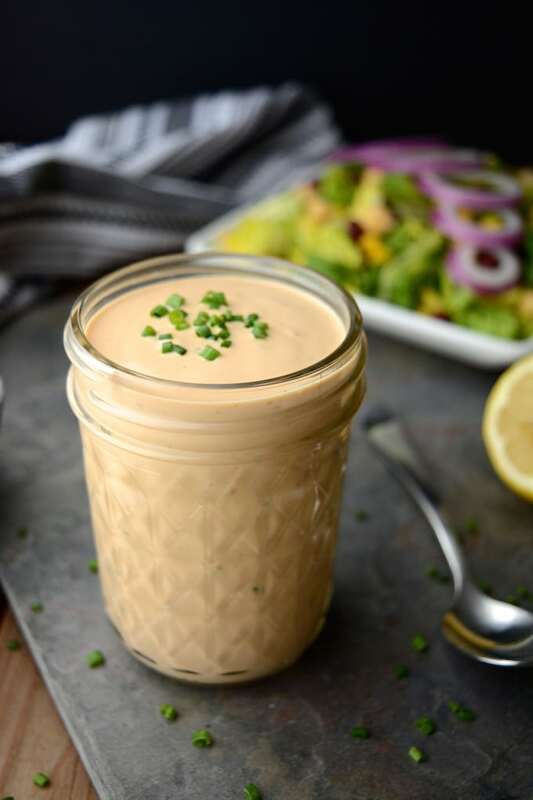 Vegan BBQ Ranch Dressing is a creamy dreamy dressing worth slathering on everything from salads to tacos & burritos! This healthy salad dressing is vegan, oil-free and gluten-free! It also has a nut-free option to make it allergy friendly. 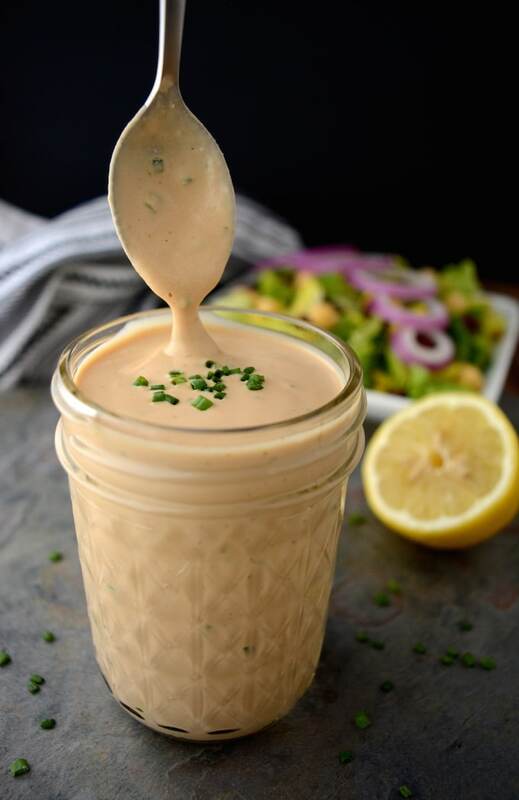 This Creamy Vegan BBQ Ranch Dressing is an old favorite! It has been with me since the beginning of my vegan journey. 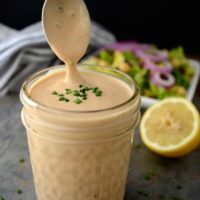 It started out as a vegan mayo-based dressing, but that quickly changed as I became more health conscious. I replaced the mayo with cashews and non-dairy milk, then added a few more seasonings for the perfect dressing. How do I soak cashews? This dressing is best with soaked cashews. If you’re unfamiliar with soaking cashews simply follow the 3 easy steps below. Bring about a cup of water to a boil, then turn off the heat. Toss the cashews in and let them soak for 15-20 minutes. Drain and rinse the softened cashews. The cashews can also be soaked overnight. Place them in a lidded bowl. Pour in enough fresh water to cover the cashews. The next morning, drain and rinse the softened cashews. 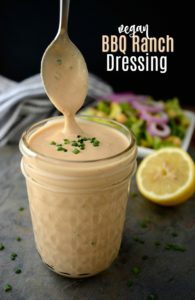 What else can I use this creamy dressing on? It’s practically impossible to avoid slathering this stuff on more than just salads! Liven up your tacos, burritos and tostadas with this healthier dressing. How do I make this dressing allergy friendly? 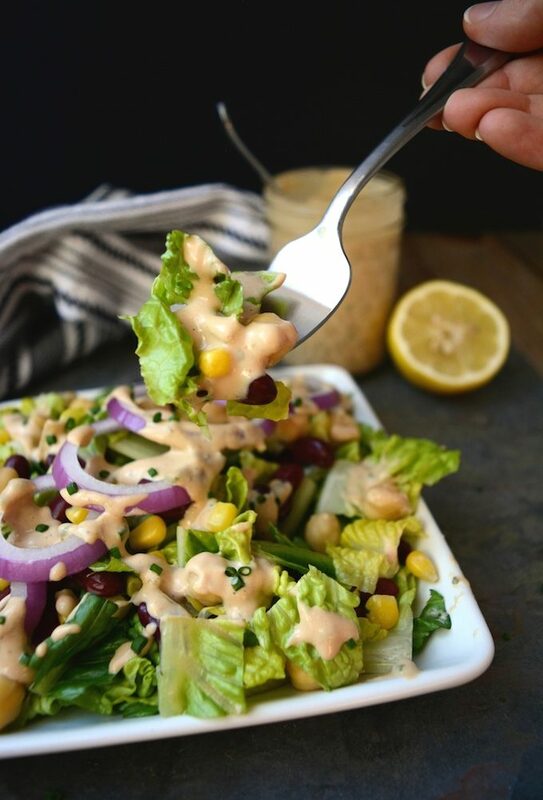 Just replace the cashews with an equal amount of sunflower seeds or hemp seeds to create an allergy-friendly Creamy Vegan BBQ Ranch Dressing! Now join us in slathering it on everything! If you loved this dressing recipe, please leave a 5-star rating in the recipe card and share your thoughts in the comments below. Also, if you snap a photo be sure to share it with us! We love to see your creations! You can find us on Pinterest, Facebook, and Instagram. 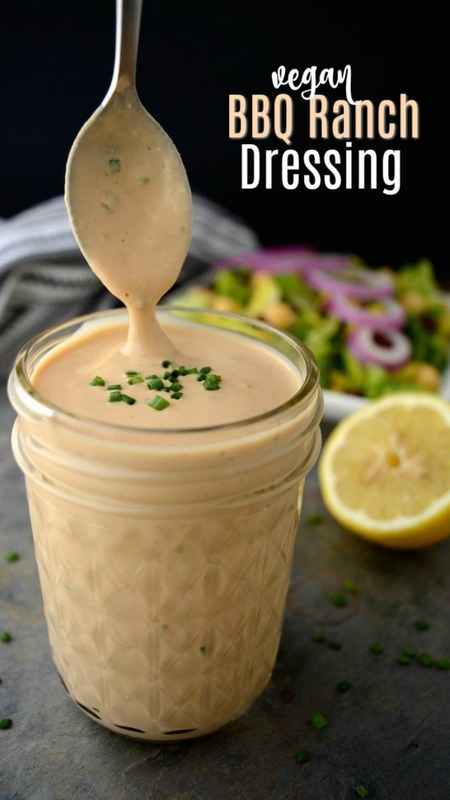 BBQ ranch dressing is worth slathering on everything from salads to tacos & burritos! This healthier dressing is vegan, oil-free and gluten-free! It also has a nut-free option to make it 100% allergy friendly. Place all the ingredients (except parsley and chives) into your blender. Blend until creamy. Pour the dressing into a bowl and stir-in the parsley and chives. Place the dressing in the fridge to cool for at least 30 min to an hour. If needed, add more non-dairy milk to achieve desired consistency. 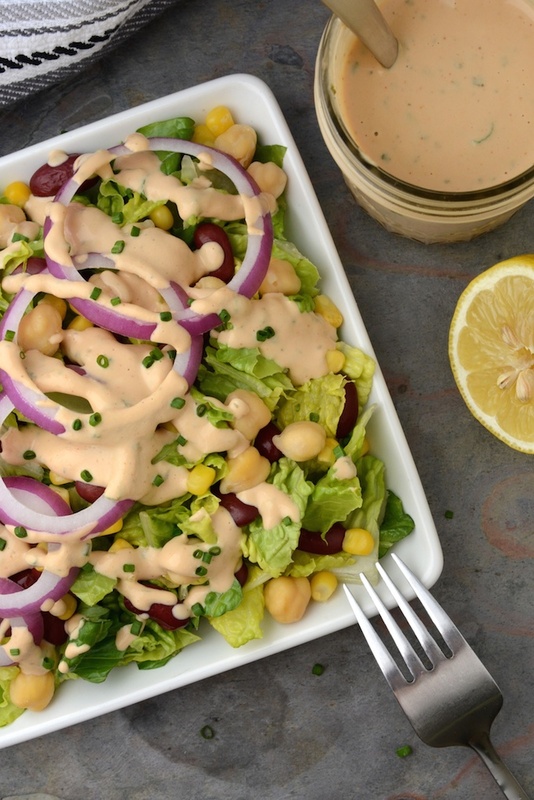 Enjoy this creamy BBQ ranch drizzled over your favorite salads, tacos or burritos. Allergy Friendly Dressing: To create an allergy friendly Creamy BBQ Ranch Dressing, replace the cashews with an equal amount sunflower seeds or hemp seeds. If using sunflower seeds, soak and process them per the cashew instructions. This recipe can easily be doubled for extra dressing. Going to give this a try here in a bit! I'm used to making vegan ranch with vegan mayo, but like you stated, it's just not that great for you (all that dang canola...) And not to mention using vegan mayo just for ranch gets pricey quick. Excited to give this a try. Stumbled here through your tostada recipe. Can't believe I haven't found your site yet! My mind is still being blown by the carrot hot dog recipe. Gonna have to try that soon. 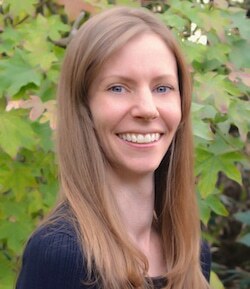 I love your ideas for turning the processed store-bought vegan alternatives into purely plant based meals. Can't way to try some soon! Perfect! I'm looking forward to it! I have a recipe or two, just haven't had time to try and make it yet. Yours seem relatively simple and straightforward so that's a plus. I'll need to make the dressing again. I was a bit impatient and didn't speed soak the cashews long enough (I'll blame our 3 month old for consuming all our time!) Too gritty. Although I will say that this is one of the first times I feel I should've added MORE lemon juice. I usually play it cautious with it, but this time I felt I should've added more. I'm curious to experiment with the recipe too, possibly try and make a "plain" ranch. 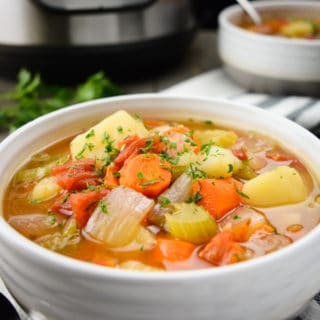 Thanks again for the recipes! Isn't it!? I always have to make a double batch! Do you think ground flaxseed would work instead of cashews? I don't think flaxseed would be a good replacement. If you are looking for a nut free option I'd suggest sunflower seeds. This tastes delicious! Thanks so much!! Delicious!!!! 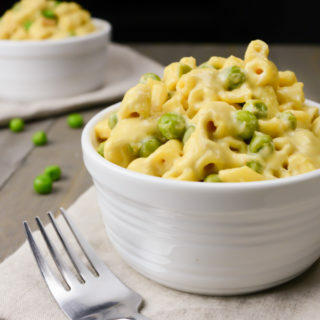 !’ I’m new to being vegan and this recipe tastes better than ‘normal ranch’ no joke!!! Thank you for sharing ! You're so welcome Emily!! I'm glad you loved the dressing! I must agree with you, it IS better than 'normal ranch'! It's honestly my favorite dressing!! Hi! Where did you get the glass jar? Beautiful! Hi Salina! Cashew milk can be used in place of the non-dairy milk. However, the cashews can not be replaced, they help thicken the dressing. Without the cashews it would be too thin and runny. I made this can’t even begin to tell you how great this is!!! 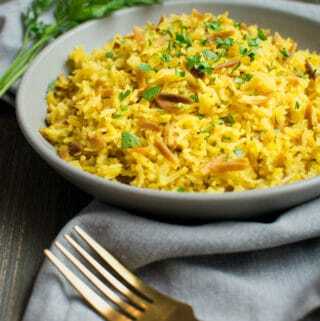 I made this recipe but instead of bbq sauce i used no salt mustard. It was AWESOME!! The rest of the recipe is a good base. I don't salt! Is is good without salt? Looks delicious! How long will it keep in the fridge?